Rachael’s visit in August was a highlight our our year, and despite me having to work (used up all vacation time between Joshua’s birth and then hospitalization), it was a very good time. 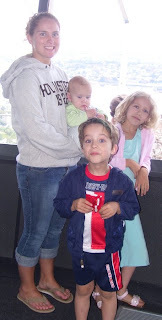 The kids, as you can see, bonded with her (she was amazing with them)…as did JoAnn. Not that I didn’t, since we did have some time at the end and the weekend to talk, but they just had much more time and activity with her. Despite her obvious lack of coffee etiquette (apparently they really don’t have Starbucks on every corner there in CT quite yet), we really enjoyed her visit and hope to be able to do again!